This book is the sequel to The Wrath and the Dawn, and therefore this post will contain spoilers for that book. You can read my review of it here. Summary: Rey is in tatters after it was hit by a mysterious magical storm, one that was probably caused by Sharhzad's father, who has gotten his hands on a book of dark magic. Having been forced to flee the city and leave behind Khalid, Sharhzad now finds herself in a desert encampment with her family, some old friends, and mysterious strangers. In the meantime, Khalid tries to seek inner peace by rebuilding his city. But nothing feels right now that his wife is gone, even if she is safe. Sharhzad realizes quickly that she isn't safe, as some of the soldiers in the encampment are apparently part of the band of mercenaries that were sent to kill her in the palace. They are part of a greater plan to destroy Rey and overthrow Khalid, so Sharhzad has to find a way to break the curse or else everything she loves - including her husband - will be destroyed. Thoughts: What. An. ADVENTURE. As I said in my review of the last book, Sharhzad is a protagonist worthy of the ranks of Celaena Sardothien. She never stops fighting, ever. She never gives up. Even Katniss Everdeen wavered at some points - Sharhzad is as fierce as they come. It was hard to have her and Khalid apart for so much of the book, but it just made their scenes together all the more powerful - they are quite the formidable pair. And even apart, the force of their love for each other is so strong that it practically drips from the pages. I also loved that there were new characters introduced, and I think they were both East Asian? (Going by the descriptions and the names.) Again, if this were going to be made into a movie, the cast would be ALL POC, except for maybe Despina. And that's absolutely exciting. (Which is probably why it'll never actually happen, because... Hollywood. They'd find a way to whitewash most of the cast, I'm sure.) We also get to know some of the other side characters better, such as Shazi's sister Irsa - I found her very compelling because even she has a small arc of her own, as she learns to be strong like her sister. 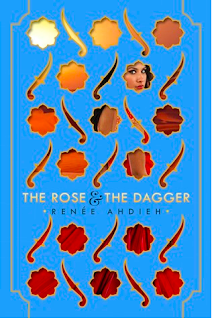 I'm sad that the story has concluded, since I would've loved to live in this universe a little more (maybe I just want more romantic scenes so I can bask in the FEELS), but at the same time, I don't have to sit on pins and needles for another year to find out if Shazi and Khalid can finally live happily together, so thank goodness for that. But still, it was such a rich, beautiful world that I am sad to see it end. Now I might just have to go back and reread them both.